Who was Ponzi, the man whose name is synonymous with the classic “rob-Peter-to-pay-Paul” scam where money from new investors goes to reward earlier ones? (It's the kind of scheme that Bernard Madoff recently used to rake in $50 billion from gullible folks all over the world.) In December 1919, Charles Ponzi was an unknown 38-year-old, self-educated Italian immigrant with just $200 in his pocket. Six months later, he was the ten-million-dollar man, Boston’s famed “wizard of finance,” lionized by the public and politicians alike. 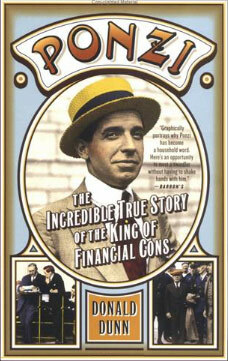 Based on exclusive interviews with people who knew Charles Ponzi, lent him their money, and exposed him, Donald Dunn’s Ponzi: The Incredible True Story of the King of Financial Cons takes an in-depth look at one of America’s most notorious financial con artists and the mad money-hungry era in which he thrived.